The Singles E Case is pretty nice with TEN new CARS, including 1 Scavenger Hunt & a rare Super Chase. You get ALL NEW (from lEFT to RIGHT, TOP TO BOTTOM) Adam Parke (Carla Veloso’s Pitty), Steve Hearsell, Bill Revs, Kiel Motorray, Richie Gunzit (Next Gen Gasprin), Xanadu Bumpers (VW Bug),, Biz Torqsen (Super Chase), CARS 3 Bob Cutlass, Nick Stickers (Metallic Scavenger Hunt) & Cam Spinner (Next Gen Triple Dent), previously released by new for 2019 and limited release so re-shown here. 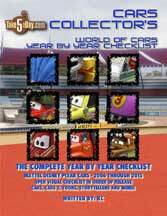 You also get variants of Marlon “Clutches” McKay if you missed him previously as a unibody release and Mario Andretti with they eyelid addition. All the other releases in this case have already been released or are no-variants except Fabulous Hudson Hornet (covered here).